Actress Shanara Gabrielle has long been a favorite in our area but the title character in “Hannah Senesh” brings her to lofty heights as this moving performance is one that none of us will soon forget. 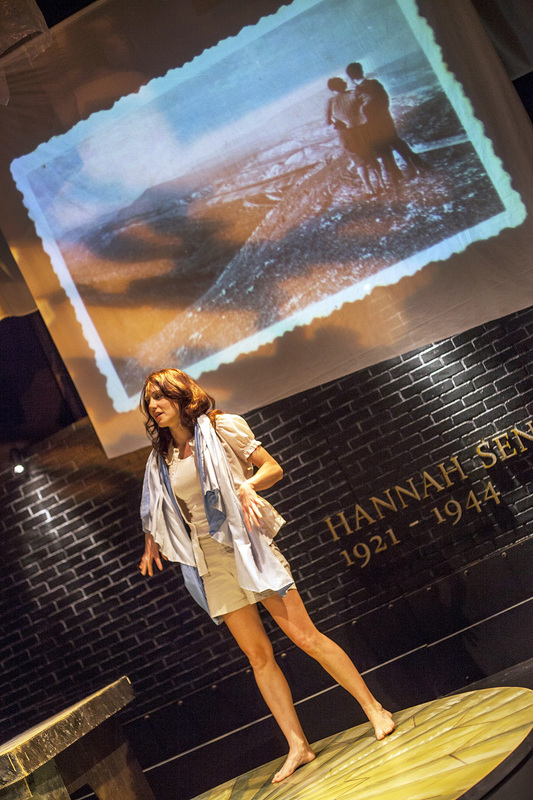 She is remarkable in telling (acting out) the story of this Jewish girl from Budapest who, during the coming Nazi occupation, never gives up her faith and eventually decides not to give up her homeland no matter what the risk. 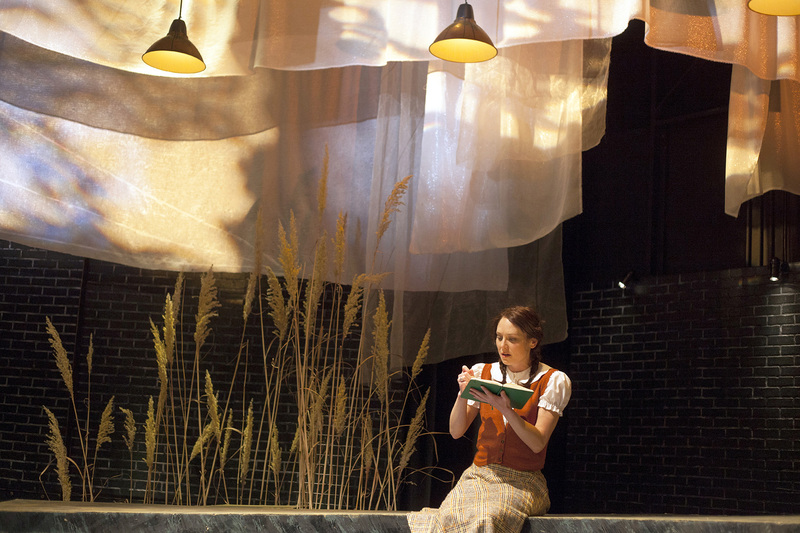 New Jewish Theatre has come up big time with this heart wrenching story and this actress who brings a youthful exuberance to a girl who grows into a courageous young woman. The audience unfamiliar with the story of Hannah Senesh gets a head start as they walk into the theatre and see a grave marker planted upstage center with her name and the dates 1921-1944. We first meet Hannah’s mother, Catherine, also played by Shanara Gabrielle. It is 1944 and a German officer comes to her home to take her to a prison. Asking if she knows where her son and daughter are, Catherine responds truthfully that her daughter is in Israel working on a kibbutz and studying agriculture. He then escorts her to a prison where she is shown a dingy, casement window in which she sees someone she believes is her daughter, waving a make-shift Hungarian flag, trying to get her attention. The scene quickly shifts back to 1934 where we see an energetic young Hannah worrying about school, boys but revealing that special something that makes you realize this a very unusual young lady. As she awkwardly attends a party where she knows no one, she thinks her life will be a solitary one. Her thirst for life and knowledge lead her to the Jewish Zionist movement which upholds their life and religion as so many are converting to Christianity in fear of religious persecution and for their lives. In 1939 she applies to and is accepted to the Agricultural School for Young Women in Palestine where, after graduation, she becomes a member of the Kibbutz Sedot Yam where she winds up cleaning chicken coops and doing laundry for her fellow classmates while studying and praying with her fellow Zionists. All this time she is writing daily in her diary and composing poetry. We learn life lessons from her work and from her studies- in particular a telling segment where she learns that root cells produce what becomes the beautiful and beneficial plants while they simply die away after they’ve done their job. Comparing it to pioneers who blaze the trails that lead others to their own personal “promised land,” we get an idea of how her life is affected by her studies. Her poetry is also an indicator of how insightful and wise she is at such a tender age- in particular when she composes “Eli, Eli” which ends with the telling words, “the voice called, and I went. I went, because the voice called.” Then the war escalates and she makes a decision to somehow get back to her mother and her homeland- knowing how dangerous this can be. She joins a British parachute troop that plans to drop into Yugoslavia. From there she feels she can cross the border into Hungary and be reunited with her mother. After capture by a German guard, played by Jimmy Betts, we eventually see her side of the jail cell as she discovers her mother outside the basement window and tears the makeshift Hungarian flag from under her skirt and waves it wildly to get her attention. The inevitable mock trial is held where she is found guilty of, ironically, crimes against the Hungarian people and is set for execution. All ending at the tender age of 23. The story by playwright David Schechter, in collaboration with Lori Wilner, is so tremendously powerful that you’re in awe of the story and the brilliance of Shanara Gabrielle brings it all so brilliantly to life. Director Kat Singleton brings every ounce of the visceral story to the stage and the music, composed by various composers- mostly to Hannah’s poetry- adds to the strength of the script. In addition, it’s a beautiful show technically. 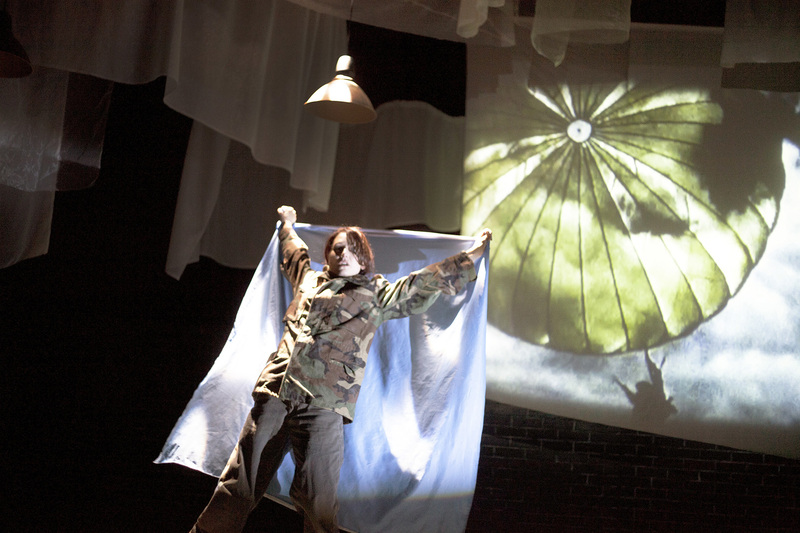 Peter and Margery Spack have designed a unique set that includes a desk used by both Hannah and her mother, an area that doubles for many sites including the prison windows, a field where Hannah parachutes into off course from her fellow jumpers and various sites in her Israeli adventures. They also have covered the back walls with material- including center stage where projections are shown- and then hung various pieces of material from the ceiling in curving and concentric patterns that react to the wonderful Seth Jackson lighting design. Zoe Sullivan’s sound and Michele Friedman Siler’s costumes complete the magic. A special nod to Noemi Neidorff who consulted on the language and sharing her families stories from Budapest during the time period of the play. The short but remarkable life of Hannah Senesh is portrayed in stunning fashion by Shanara Gabrielle in the New Jewish Theatre production. “Hannah Senesh” runs through December 22nd- call them at 314-442-3283 for tickets or more information. This entry was posted on December 6, 2013 at 9:43 pm12 and is filed under Uncategorized. You can follow any responses to this entry through the RSS 2.0 feed. You can leave a response, or trackback from your own site. Spot on with this write-up, I seriously believe that this amazing site needs much more attention. I’ll probably be back again to read more, thanks for the info!